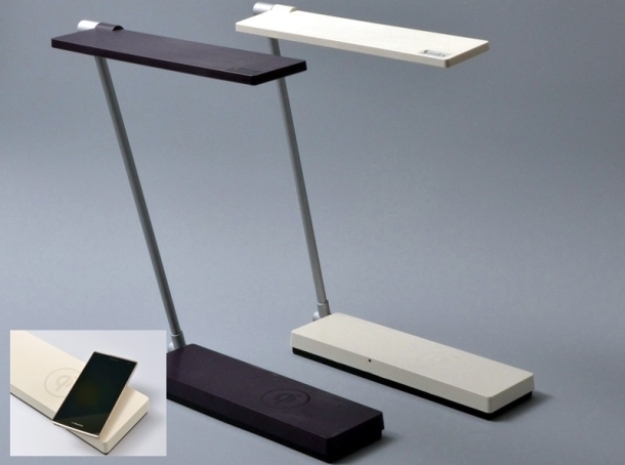 Japanese company Konica Minolta has introduced a handy LED desk lamp that can also wirelessly charge devices. The ‘Symfos LED Tasklight’ is the first to feature a built-in induction charging pad for smartphones and other technology products that support the Qi wireless charging standard. This eliminates the need to plug in two separate devices at your desk. CNET reports that the 1.5-foot-tall lamp is available in either ivory or dark blue and it also boasts a built-in touch sensor that allows the user to gradually increase the light’s brightness up to 1,400 lux. You can get your hands on one for the rather pricey sum of 24,800 yen ($302). Next articleWhere is the Nexus 4 Wireless Charging Orb?